After almost a month on land and living in an air conditioned house we are struggling to make the adjustment back to the boat. On arrival in Phuket we thought the weather was great. A gentle to strong breeze blew most of the time and we seemed to be enjoying the great weather. Now it is like starting all over again. After sleeping in the house where we could turn down the temperature to a freezing 22 degrees so we could snuggle under the duvet we now sit stripped down, drenched in sweat with all the fans on. Tonight I am lying out on deck to escape the down below stuffiness as there is no breeze tonight. It comes with benefits though. I can hear the music from onshore with loud rock but over to port I hear what I think is a sad Chinese lament of lost love and karaoke off to the strern. But then off to starboard aft I can hear what could almostbe Celine Dion wafting across the waters from another yacht. Perhaps what I should do is go down below and get my I-pod to tune everything out. I still stay glued to the deck as the half moon has risen, it is a clear tropical night and the lighted giant Buddha is shining down on the anchorage. 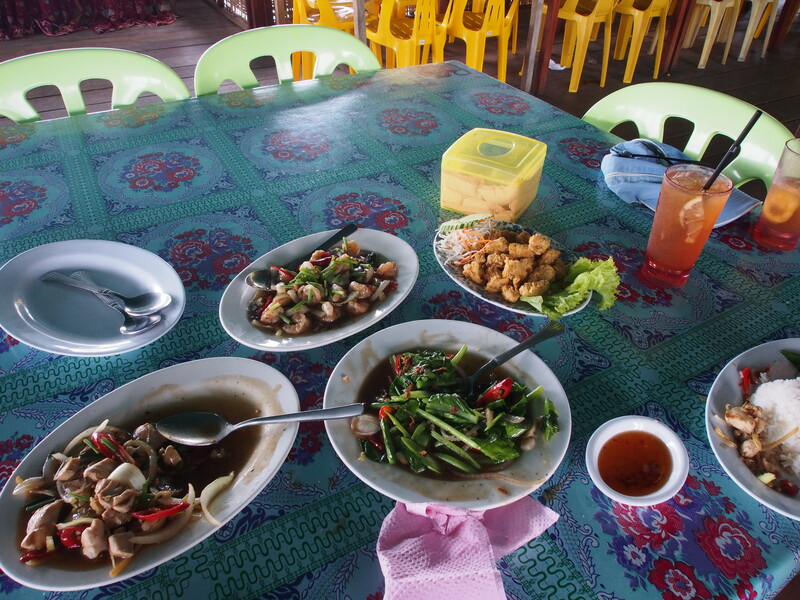 We have just come from onshore where we treated ourselves for our last, at least for the time being, meal in Phuket. No we did not have some exotic sounding Thai meal but rather partook in the Sunday roast at Ao Chalong Yacht Club. Me, roast lamb and Connie, in preparation for arrival in a Muslim country, roast pork. One always meets interesting people at the yacht club. There are many ex pats who drink at the club and then there are the itinerant drifters who drop by on their way from point A to B and then beyond. Tonight we met Earl. An Australian whose work is based in France, currently on a 2 year leave of absence and who just arrived from South Africa via Madagascar, the Maldives and now Thailand soon to move on to Malaysia and Indonesia. Earl sails an old Colin Archer schooner which he has just refurbished after nearly sinking twice in the Indian Ocean. He basically tore his boat apart, rebuilt all the frames, the deck and the interior. Needless to say he has spent a fortune but he does work as the skipper of one of the few remaining whaling ships (power) which is 30 metres in length and is currently on the market for sale for $250,000. Yes, despite the pristine condition no-one wants to buy it. Costs close to $500,000/year in maintenance. Anyone interested in buying contact me and your finders fee will be very low. Well, that’s it for the night before departure. Tomorrow we hope to start off south. We get to test out the newly insulated fridge, the sinks, the new taps, the soap dispenser and get to sit and smell the new teak in the cockpit. We are like kids at the exhibition. Boyit does not take much to get us excited. We must be deprived. Oh yes, and for the first time ever we are loaded up with 7 movies thanks to the Toronto International Film Festival (TIFF), our high speed internet at the house we rented and I tunes for putting their 99 cent special on during the festival. I will not bore you with details on all the movies but we have watched a few excellent movies from the festival..
Oh yes I almost forgot. I have season 4 of Breaking Bad and Season 3 of Mad Men. I know, I am addicted to both and also way late in getting to watch them. We still have a few small things to do. First off Connie heads ashore, hops on the bike to go to the market while I head out in the dinghy to get a few photos. Leaving the boat to head ashore we leave the yoga matt out on deck with a few water bottles on top to assure it does not get blown away. Connie quickly cycles to the local market, picks up a few forgotten items and then calls to say she is ready for pick up. I am still out taking photos but head back, fold up the bike, load Connie’s market treasures and then we take the dinghy over to the beach to collect our last lot of drinking ice. What boat goes to sea without the much required ice for the gin? I can only hope the ice lasts as long as the gin. We headed back to the boat, clambered back on-board and started to store things away. Picking up the water bottles off the yoga mat I noticed three black marks. Looking more closely I realized the yoga matt had been burnt by the sun being magnified as it passed through the water. Who would have expected that to happen? I doubt it would have caught on fire but I am not willing to experiment with that concept. We are still not done. We have a lunch date that coincides perfectly with realising that we are almost out of fuel for our dinghy. So, once more ashore to meet up with Denny a friend we first met back in Port Dickson for lunch and buy some fuel. 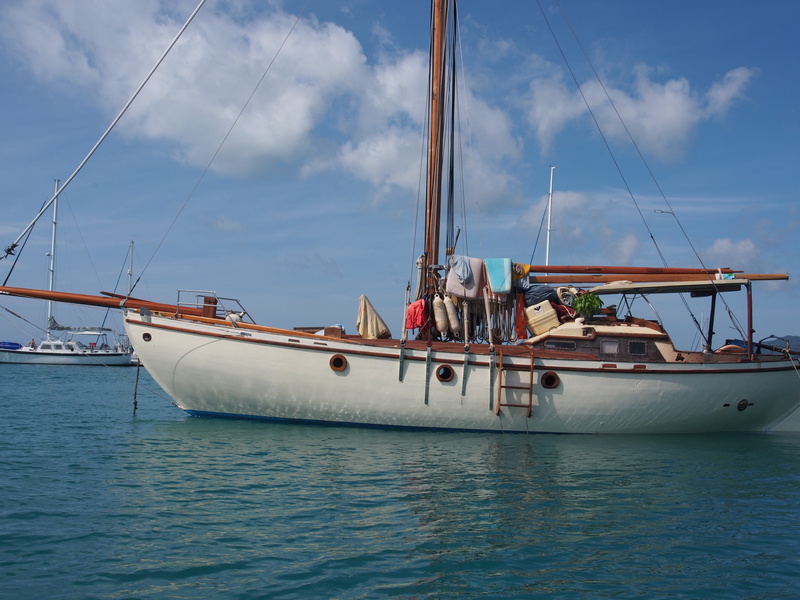 Denny is 75, sails solo most of the time on a Spencer 53 foot sail-boat. For the last month he has had his grandson visiting and they have managed to fit in scuba certification for Taylor, sailed to Lankawi and back with stops at a number of islands for scuba adventures. I admire Denny’s resilience but do not think I want to be out saling at 75. Who knows, 75 isn’t that far away! Lunch over, engine started and off we go only making two miles to the first anchorage south! We’re happy. The wind blows freshly, the skies are clear, the water is a little clearer and the anchorage is only 2 metres deep. Wind blowing from the west at 10 knots. 0700hrs we pull up the anchor and drift away from the island while munching away on breakfast which is leftover last nights dinner made into an omelette i.e. Scrambled eggs with a sausages and fried potatoes. The boat takes care of herself while the genoa pulls the boat along at 5 knots. We know we do not want the hassle of Phi Phi’s main harbour so head around the south east corner and supposedly an anchorage in 11 metres off a sandy beach. Is nothing sacred? 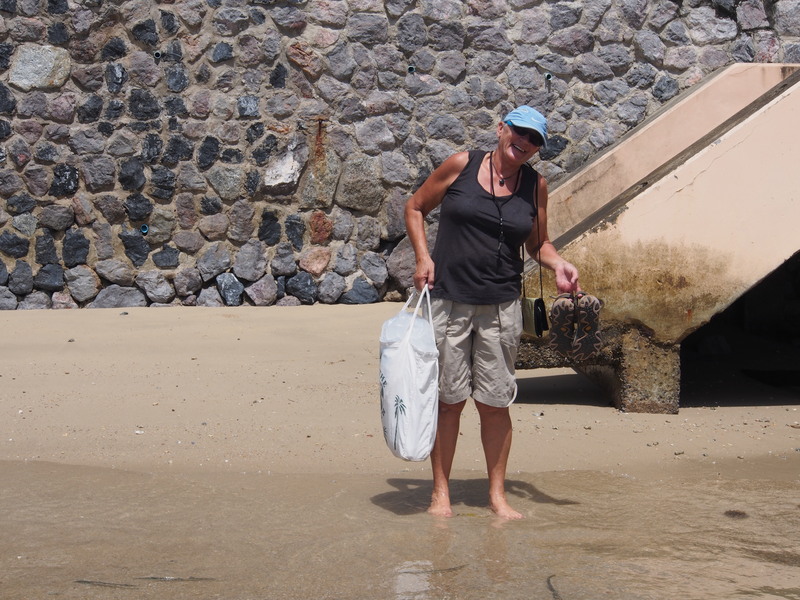 We arrive at a sand beach at low tide and cannot find the 11 metres but rather 18’metres and a beach fringed with a coral shelf. Ah, great for snorkelling. The only problem is there are at least 20 power boats each with 30 people on-board tied stern to the reef. Passengers are all bobbing around in lifejackets and the reef looking like an apple dunking tub at the country fair. Once one boat leaves two more arrive. They arrive with great fanfare. Having three 350 h.p. engines they do three doughnuts in the anchorage at high speed to the thrill of the passengers who must think they are on the roller coaster at Coney Island throwing their arms in the air and screaming for more. All I feel like is taking out my flare gun and carefully aiming at the fuel tank letting go with a barrage. Makes me wonder if I can purchase a repeat firing flare gun. Well, it is the only anchorage close by and we are a little burnt by the sun and know night time will bring relief from tourisma extravigansa. 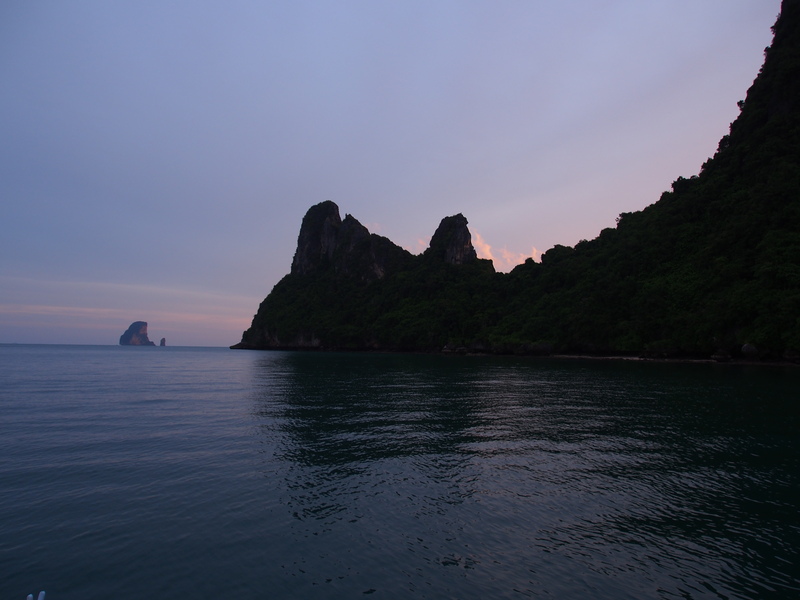 However, we also learn that we are on a major passenger route between down-town Phi Phi and the east coast resorts. Combined with the bobbing apples we are also rolled side to side by the ferries, bangkas, ski boats, fishing boats and whatever else decides to fly by with either 3 X 350 h.p. or what sounds like a NASCAR without a muffler. 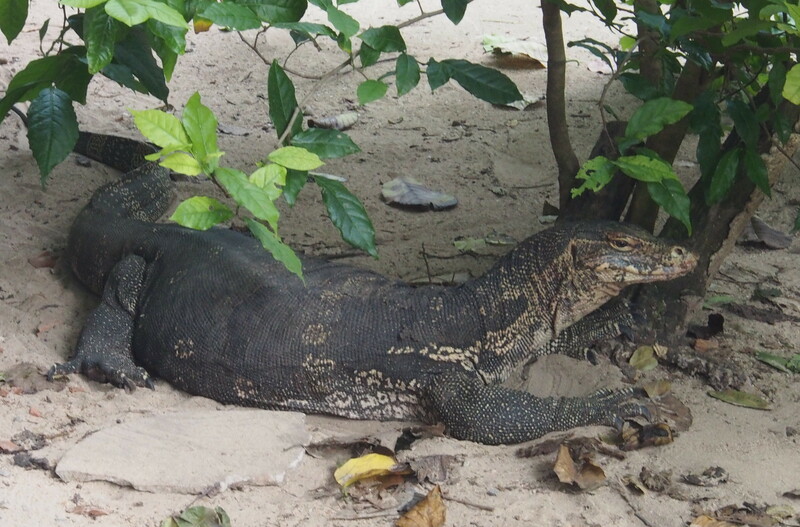 I think the tourism industry here is slowly learning that tourists do not like to be deafened by unmuffled longtails but a few die-hards still survive. Finally peace arrives by 1900hrs but by this time I have sworn never again to come to Phi Phi. The problem is that in transit from or to Langkawi or Phuket it is a convenient stop. But if there is a next time I will come with a multi repeater flare gun! Amazing. Pulled up the anchor at 0700hrs and as the breeze pulled us out to the open water we sat and had our tea, cereal and warmed buns. Sky was clear a strengthening breeze and we were off on our next 38 mile leg to Ko Roc Noi, a small uninhabited island that is now a national park. Our only concern was if the island would provide us enough protection from the SW swell. We rounded the north end of the island at 1330hrs still wondering if we would get a comfortable night. First we see one Thai fish-boat anchored out on the spit at the north end and then two then twenty then when we have a clear view of the anchorage another ten to make it forty! Yes, the anchorage is protected. We know the fish-boats are anchored for the day while they rest up before heading out at night for their regular fishing routine. It seems there isn’t and part of this coast that is not fished. Sustainable? I have no idea but I suspect not. As we manoeuvre in to anchor we cut it a little close and come close to skewering ourselves on a coral head. We are always looking for the opportunity to anchor in 3 metres of sand but typical of this coast the shoreline is fringed with patches of sand interspersed with coral heads that are too close to the surface and too close together to manoeuvre Sage amongst them to find a secure anchorage. So it means heading out to where the water depth is 12+ metres and where there are fewer coral heads. We find a good spot and wonder why we see no other sail-boats. It’s almost perfect. There is a slight swell that sweeps around the island making us roll slightly. The wind is channelled by the break in the two island allowing the tidal flow to move through the anchorage. The gap is angled in such a way that in the SW monsoon the majority of the swell is broken down. So, here we sit, we are anchored two hours before low tide, there is still ice in the cooler from Phuket and the wine bottle is uncorked and the brie cheese is in a perfect state to be eaten with the remaining epi. We are rapidly running out of all our wonderful fresh treats from last minute shopping in Phuket! These are not the types of things available in Langkawi. A day to relax and take in the various opportunities available in the anchorage. Most of the fish-boats anchored late in the evening are now gone. I can only imagine they are just pulling up their nets from a night of trying to second guess where the fish are. Am sure the boats will be back in later to rest up for another night of fishing. Our first call is a trip ashore to where I can see a run of fresh water spilling on to the beach from the forest. Fresh water showers might be the order of the day. Sad to say the water turns out to be too brackish; the high tide pushes the salt water up into the basin making the water impossible to drink and even dubious for showers. Ah well there is a ranger station and camp-ground further along the beach. The camp-ground is immaculate but the place is empty except for a few staff who speak very little English. 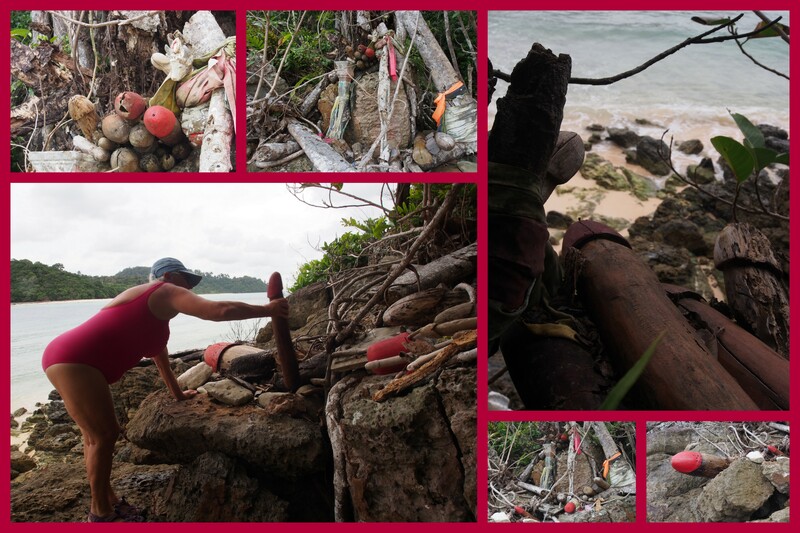 The island was used for the French ‘Survivor’ series and we think the complex infrastructure in evidence on the island was a result of the TV series. There are 80 solar panels tucked in amongst a grove of trees that have been cleared to allow sunlight through for at least a part of the day. There are also cottages dotted around the woods but all in very poor repair. They look solidly built but on closer inspection the wood is rotting, the water facilities disconnected, the pathways overgrown with weeds and most of the windows broken or in poor repair. It is obvious that at one time there were expectations of lots of visitors but is it the lack of maintenance or the remoteness of the location the reason for the state of the buildings? I do not know the answer but even now there are no other sail boats in the anchorage whereas in January there must have been at least 12 pleasure craft. Ah cool off and see how many fish we can find? Another gift. A relaxed day spent doing a few on-board chores, reading and then three hours snorkelling around various spots on the east side of the island. The coral is reasonably healthy in places and in others show either the ravages of dynamite fishing or simply the slow rejuvenation process. Whatever area we swim through it is a pleasure. When you do come onto an especially lively piece of coral there is a rainbow of colours to enjoy from the frills of the clams to the quickly darting fish. At times great schools of brightly coloured fish follow us for ages and at other times we glide over large expanses of sand as we swim towing the dinghy behind us looking for another coral head to hover over. The water is exceptionally clear which is a real treat. This area of the ocean does not have a lot of clear water anchorages and it is always a treat to get far enough from the mainland and out to the islands where most of the time one gets clear water. The fickleness of sailing in the SW monsoon season. We sail up the anchor and start our 32 mile trip across to Phaetra. Our original destination was Ko Bulan but with a dead downwind run progress is slow as the apparent wind drops to about three knots. We roll our way over the waters making slow progress. Gives us time to enjoy the day and the scenery. Always keeping on eye out for fish boats, fish nets, buoys etc we are surprised by a fin off the port bow. It is not something usually seen so we are knocked out of our somnambulist state realising what we are seeing is two whale sharks. We have never seen whale sharks and it has made our day. We didn’t even know whale sharks were in this area and wondering how they have managed to escape the fisherman’s’ nets. Although the event only lasts a split second it gives us something to talk about for ages. However we still have a few miles to go before our altered destination, Phaetra. Readers of the blog will remember thst on our way north we also stopped here and we came to the conclusion that it was the island of lost sailors souls. This time we did not meet any. Evening descended. There was no one to share the anchorage with us and the fishing boats were out at sea or so we thought. The day started early. 0330hrs to be precise. The evening had been still and humid so I was sleeping on deck. There were no other boats around and we were anchored in an area where there was about 2 square kilometres of anchoring room all in less than 8 metres. 0330hrs comes and I am half conscious of a fish-boat motoring by very closely. It is crawling by. I do not arise thinking yes it will keep going. Suddenly the engine stops. That wakes me up. What is going on? What with all the anchoring space available is this guy doing anchoring less than fifty metres from us? Their lights are on, it is a large fish-boat with a crew of 7. They are all chattering away as though the diesel engines are on full blast and they are banging away on pots and pans and whatever else makes enough noise to wake everyone within three square kilometres. But we are the only ones within hailing distance. My overly active imagination goes into full gear. They’re setting this all up to board us and take what they want. What can we do? Out comes the flare gun, spread the tacks on the deck, fire up the satellite phone, turn on the VHF and generally stress out. So what are they doing? They are out on deck mending their nets, they are singing away and after about ninety minutes things quieten down and they are obviously resting. I cannot stay awake any longer and snooze away in the cockpit with the flare gun loaded. I am startled awake by the starting engines. “OK” I say to myself. “Come and get us if you can”. But no, they motor off for another day of fishing leaving us with gaping mouths feeling like fools. I should say me because Connie was not concerned and early on had called me crazy and went below to fall asleep in the V berth. Oh well we are awake so we may as well head off. 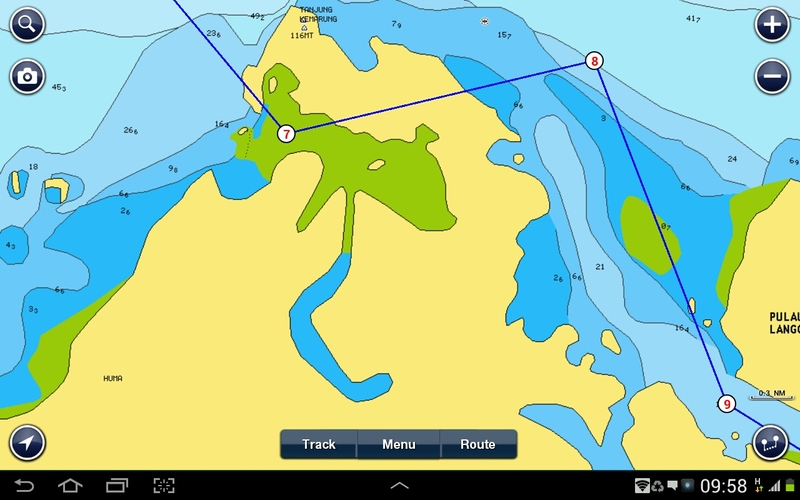 Pull up the anchor and off we go for a beautiful 18 nautical mile sail to Ko Bulan. It is one of our favourite anchorages as on our way north we stopped and found a fresh water stream. Lovely short sail down. Clear skies, gentle seas and wonderful scenery. Taratao has an intriguing history. 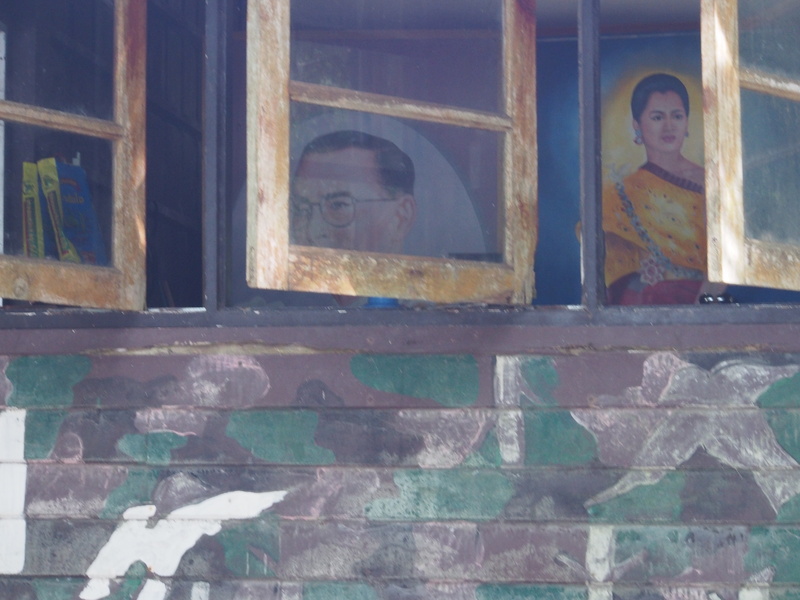 It was used as a prisoner camp particularly during the height of the communist insurgency in the 1950s. Oddly enough in one of the english language newspapers here was a story of a returning communist being arrested at the airport with ‘seditious’ written materials in his suitcase. The chief of police in Kuala Lumpur was quoted as warning citizens they had better not read or have in possession such materials. I have now cleared out my bookshelf! Since when was free speech and thought outlawed in Malaysia? Anyway back to Taratao. There are many miles of walks to do on Taratao including a walk through the old prison camp and the cemetery where some 700+ graves are marked. Best of all though is the non stop water hose at the end of the 75 metre jetty that was built to unload prisoners. The jetty is now crumbling but with attitudes like those expressed by the chief of police we may have a work project in progress in the not too distant future. We made ample use of the water at the end of the dock and managed a few short walks. We are still finding the heat oppressive and difficult to exert ourselves during the heat of midday. 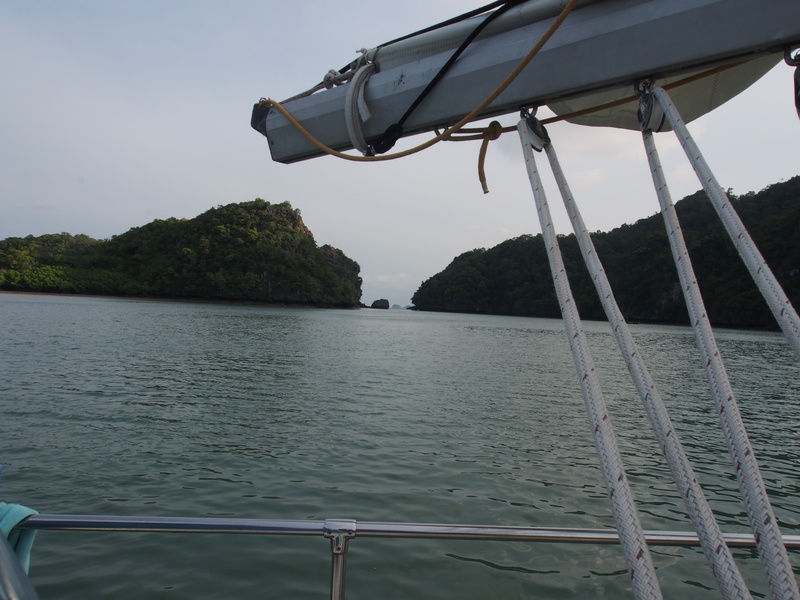 However, the beauty of Taratao drew us out of the boat’s cocoon and out and around the island. We will make it back there again on one of our forays north or south over the next while. So now we cross over the border and back into Malaysia. Tanjung Rhu was a 15 mile jump and is situated on the north eastern shore of Langkawi. We had not been in before and on the charts it is shown as inaccessible for draught vessels. However, we had seen other boats in there so decided to give it a try. Interesting entrance. 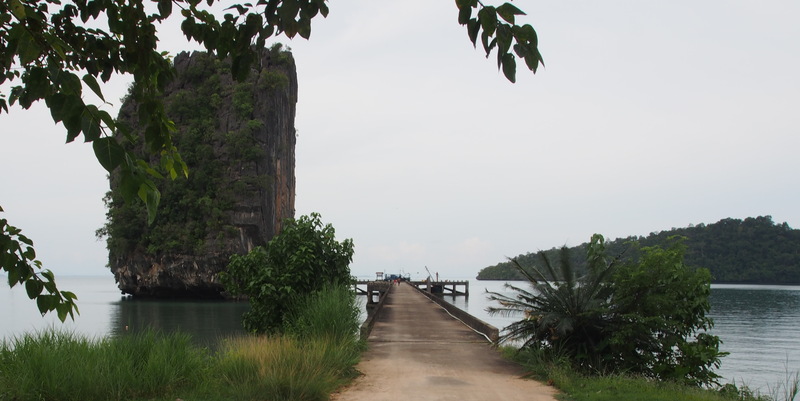 The entrance is not simply for a bay but for a complex and very large mangrove basin. There are untold numbers of channels navigable by small boats at high tide. Tourist boats make good use of the area taking people into bat caves, off to see eagles and to the numerous floating restaurants with sea pens attached where you can make your lunch choice. 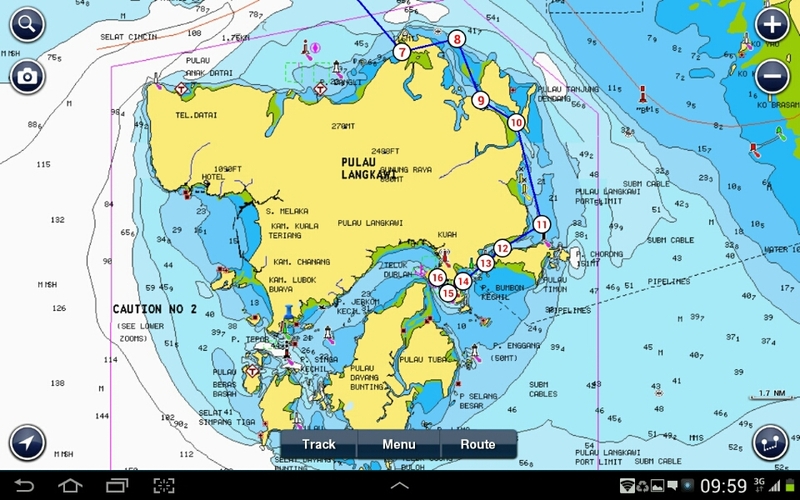 Tanjang Rhu anchorage – no point 7 to 8 was not our route! Coming into the anchorage was nerve racking as depths varied from 1.5 metres to 8 metres. Never having been here before and not having any clear chart of the possibilities was a little tense. However we found a place that was about five fathoms and dropped the anchor. It was in the main channel from the open water through to the mangrove area and in the distance we could see the floating restaurants which we were dying to try out. We let the boat settle down, made sure she wasn’t going to drag and then we hopped in the dinghy for a little excursion ashore. First stop was the floating restaurant. What a great place. You can walk around and look at the nets they have in the water with all the varieties of fish they will cook up for you. There is snapper, ray, huge prawns, squid etc. Feeling sorry for the penned fish we chose the most innocuous and most common – squid. I love squid. They have a lovely way of making squid here serving it lightly fried and kind of like a salad with green mangoes. Lovely sauce and accompanied by a few other dishes. we were so thankful to get off the boat and have someone else prepare and cook the food. After lunch we motored around the mangrove area for a while, took a walk onshore and then headed back to Sage. 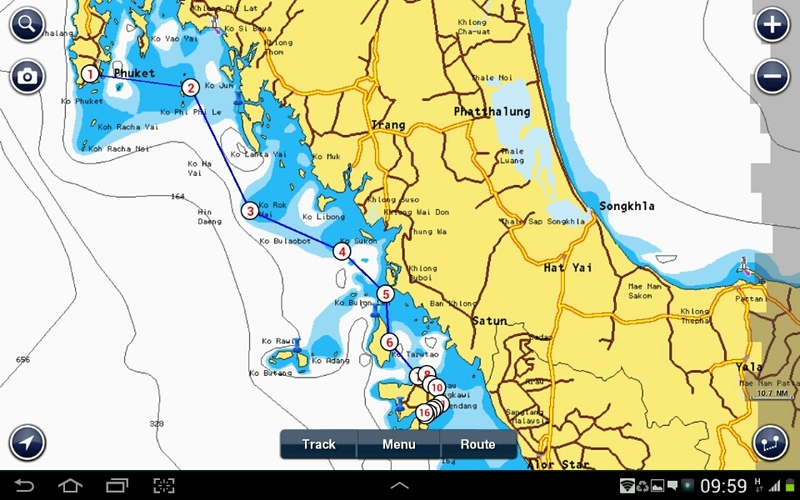 Next day headed to Khua, check in and perhaps some acquaintances in the anchorage or at the yacht club. It will be our home for the next while as we welcome some old sailing friends coming in from the U.S. and wait for our next guest arriving from Edmonton. Hi. 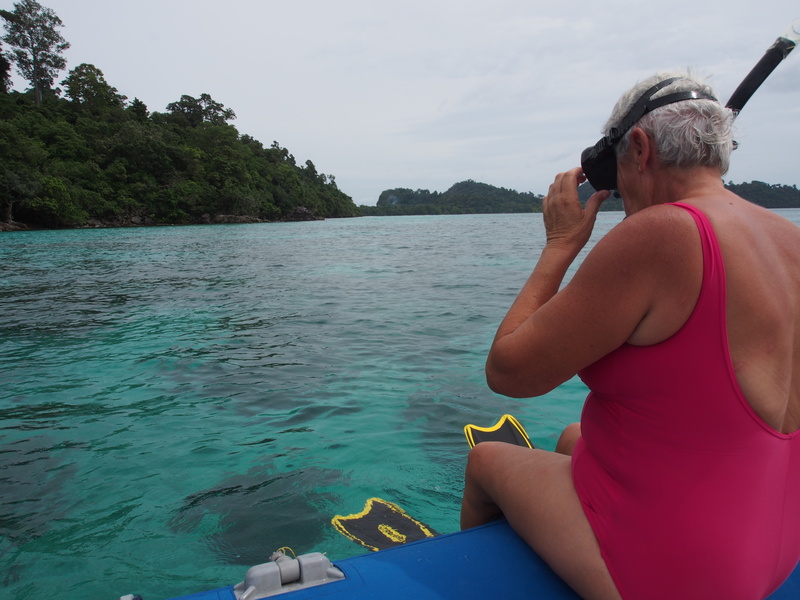 Tony and Connie, Thank you very much for your detailed diary of your trek from Phuket to LANGKAWI I hope you are enjoying the new improvements that have been done on board SAGE Enjoy the warm and sunny weather down there and hope the humidity is not too much for you , those trade winds are a relief for you too. Dale and Elsie and our selves are going to hear the talk from JEANNE SOCRATES of her sailing circumnavigation . She hails from Ealing in west London and is the oldest young lady of 70 who has completed such a trek. Her boat is called NEREIDA a 11 meter yacht. It is going to be an interesting evening. Happy sailing and may you both have fair winds, the weather has now turned cooler now and wee have experienced some strong winds over the weekend,with lots of rain. Cheers for now , Bill. Nice report, thoroughly enjoyed. How come youse eat so much? Tony, I really enjoyed this travelogue and the map really helped. Maybe when you guys get back you an do a ‘talk’ about your adventures. Your blog will really help you with some of the details that start to slip your minds. Any luck finding a place in Vic to house sit? Lots of offers for places to stay at in law duites but no house sits. I think it is a bit early for people planning vacations or maybe we are just considered house sitting pigs and it is best to avoid us! Anyway, I will send out the note again in January as a reminder and that might bring some reaction. We do have a chance to house sit Kirby and Mary Lynnes but they just hear their daughter is pregnant and they may cancel their holidays. And here i was looking forward to meeting you for breakfast at the beacon hill drive in!